Is bond bubble losing air? Click the chart to track bond yields. Investors are trying not to fight the Fed, but the central bank's mixed messages are causing confusion. During the past 24 hours, the yield on the 10-year Treasury note has swung from a low of 1.89% to a high of 2.07%. Bonds initially rallied Wednesday after Fed chief Ben Bernanke said the central bank would continue to keep its key short-term interest rate near zero and remain engaged in a controversial stimulus policy which involves buying $85 billion a month of mortgage-backed securities and Treasury bonds. Investors were further relieved by Bernanke's emphasis on an ongoing loose monetary policy. He warned that "a premature tightening of monetary policy" could derail the economy, a consequence the Fed is looking to avoid at all costs. But that relief rally was short lived. Later in the afternoon, Bernanke raised the possibility of pulling back on the amount of bonds the Fed buys each month within "a few meetings," while minutes from the Fed's latest policy meeting showed that some central bank members were willing to dial down the Fed's bond-buying program as soon as June. "We can call Bernanke the Hamlet Fed chairman," said Jonathan Lewis, chief investment officer at Samson Capital Advisors. "He is thinking, 'To buy or not to buy the 10-year Treasury, that is the question.'" The fear that the Fed might begin to tap the breaks on its stimulus program sparked a rush out of Treasuries, pushing the 10-year yield above 2% for the first time in more than two months. The 10-year yield continued to hover above 2% Thursday as those worries lingered. 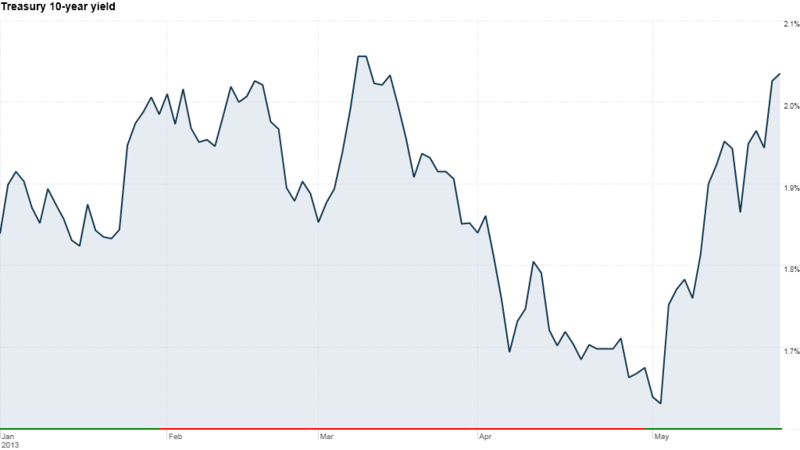 The rise in yields in fairly significant, given that the 10-year yield was hanging around 1.6% earlier this month and experts have been warning about the bond bubble bursting for some time now. While the rise in interest rates has thus far been modest and slow, some say the run-up could be much more severe once the Fed begins to unwind its stimulus. The value of bonds declines when interest rates move higher, leaving investors who own bonds with steep losses if they wait to sell until rates are already rising. But Lewis said Bernanke is determined not to have a repeat of 1994 bond market sell-off, so the degree to which the Fed tapers off its bond buying program will be measured carefully.